The team at switchrates.co.uk have one mission – to bring down your monthly mortgage costs. If you are an existing borrower you have a few options to keep your mortgage interest rate from creeping into a SVR (standard variable rate). The is SVR is of course almost always a higher interest rate. Let’s talk you through the options that wont cost a you a penny. This is the most common method of securing a competitive interest rate. We want to help borrowers who are coming to the end of a fixed mortgage period or are currently in a lenders Standard Variable Rate. This can be up to 3 months in advance of a mortgage deal coming to an end. If your deal ends you will be paying a lenders SVR (standard variable rate) and your monthly mortgage costs can increase significantly. 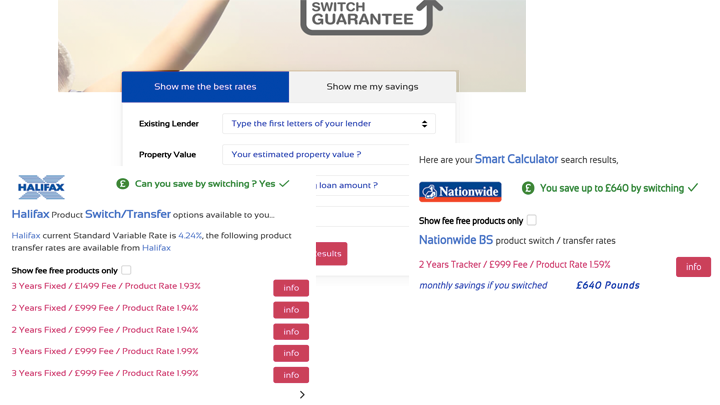 Use our online calculator to compare the rates available from your mortgage lender. You can also complete your existing mortgage details and the calculator will show you exactly how much you can save. You can then submit your enquiry and a qualified adviser will contact you to complete your transfer. The service is completely FREE and often the advisers can switch you to a better product within a couple of hours. So no matter if you have an Interest Only mortgage, a BTL mortgage or any other combination – we can help you switch.